It took a hell of a long time for LA quintent Local Natives to come out with their second LP, Hummingbird, particularly if you consider that 2009’s Gorilla Manor was actually recorded a year before it dropped. I’d like to think this latest release was made around the same time, then left to sit, fermenting, the backing tracks disintegrating slowly, unevenly, dissonance forming from consonance, until it all settled like sediment at the bottom of the murky mix. Only then did Taylor Rice make his way into the studio to wail out the vocals. While this fantasy is naive (not to mention quite scientifically impossible), and five years does seem a bit extreme, I’ll give the guys whatever leeway they want for handing back a product as impressive as this one. Gorilla Manor was a sampler. 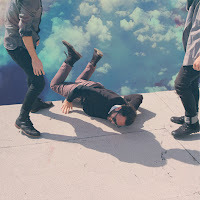 The band stretched their arms, dabbling in this and that, putting together what was ultimately a nice collection of decidedly eccentric indie-pop (a label cemented by their cover of quirk-kings Talking Heads’ “Warning Sign”). Here, the focus is all on precision. It’s somber, far more moody than before. Frills and embellishments are subdued, but more ingenious. The Natives are out to make an impression. This is most obvious on the wonderful “Breakers” single. The song is a sure winner, layered thick with dense synths, chirping guitars, and distant chamber keys. The jarring analog-malfunction quasi-rhythms of the middle section sound more arresting and fresh with each listen. At every turn, Drummer Matt Frazier’s marching-band floods of snare taps take the defining role they were made for, falling in and out of songs like “Heavy Feet” so explosively you almost forget just how relaxed you feel. The whole thing is calm and collected in a way that feels very much like In Rainbows, so much so that I get the feeling the album would have been more warmly received with Radiohead’s name on it. Things start to slow down towards the middle of the record, songs falling back more and more frequently on the strength of Rice’s vocal acrobatics. Luckily, his performances are consistently dazzling. As a singer, he’s got immense control, playing his vocal cords like a treated synthesizer, always seeming to get out of them exactly what he wants. Every now and then, he drifts into the melodramatic, but there’s no denying the powerful simplicity of lines like “Every night I ask myself/Am I loving enough?” on the heart-wrenching emotional peak, “Colombia.” You’ll feel yourself almost immediately thrown into a room, sitting, invisible but listening, between two people in immense pain. That’s the album at its best, forcing you to stop what you are doing to soak in the reverberations of the damaged feelings being conveyed. Hummingbird shows an excellent pop band coming in to their own and realizing their potential in a very exciting way. There are moments which feel like filler, but that doesn’t make the explosive energy and emotion of high points any less powerful. It’s cloudy day music, made especially for those times when nothing seems more enticing than staring blank-faced at your blank bedroom wall. Somewhere, between the alternating torrents and trickles of sparkling noise, you may be able to find the inspiration to go outside and take a breath of fresh air, maybe even smile.